This Turkey Tail point was found several years ago in a cultivated field in Clinton County, Illinois. The majority of well made Fulton Turkey Tail points, like this example, have been found in caches. So it's likely that this point was part of a cache of other points. 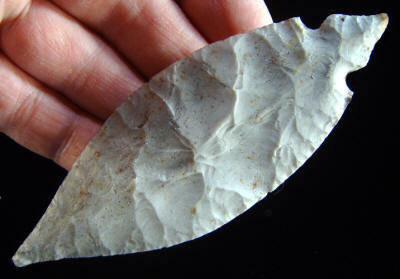 It's made of Indiana Hornstone and it measures 4 5/16 inches long.